The untold story of one of the most influential hip-hop musicians of all time "All Eyez on Me" arrives on Digital HD August 22 and on Blu-ray Combo Pack (plus DVD and Digital HD) and DVD Sept. 5 from Lionsgate. A gritty narration of the late legend Tupac Shakur’s rise and fall, newcomer Demetrius Shipp, Jr. portrays Shakur, alongside Danai Gurira (“The Walking Dead”) as Afeni Shakur, Lauren Cohan (“The Walking Dead, ” Batman v Superman: Dawn of Justice) as Leila Steinberg, and Kat Graham (“The Vampire Diaries,” 17 Again) as Jada Pinkett Smith. Character appearances from other ’90s hip-hop legends include Dr. Dre (Harold House Moore), Snoop Dogg (Jarett Ellis), Suge Knight (Dominic L. Santana), Notorious B.I.G. (Jamal Woolard), and more. Directed by Benny Boom and written by Jeremy Haft & Eddie Gonzalez and Steven Bagatourian, "All Eyez on Me" tells the true story of prolific rapper, actor, poet, and activist Tupac Shakur, from his early days in New York City through his evolution into one of the world’s most influential voices before his untimely death at the age of 25. 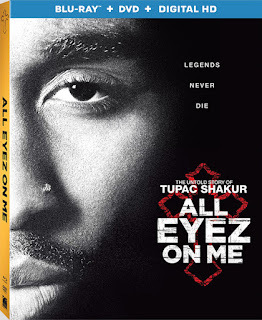 The home entertainment release of All Eyez on Me features all-new bonus content, including featurettes chronicling the making of the film, a look at Demetrius Shipp, Jr.’s transformation into Tupac, exclusive behind-the-scenes interviews, deleted scenes, and cast audition tapes. "All Eyez on Me" will be available on Blu-ray and DVD for $39.99 and $29.95, respectively.